Mac was born in Stratford, Ontario, and was blessed to be raised on a farm along with his nine brothers and sisters. Judy comes to us from Wales and they have been married for 33 years. They have a son, daughter and four amazing grandchildren. Both Mac and Judy graduated from Covenant Bible College, England, and have had the privilege of being mentored by some very special “spiritual fathers and mothers” during their lifetime. 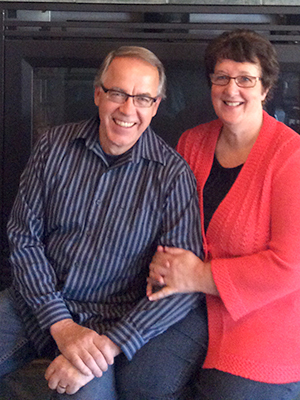 Both Mac and Judy are ordained ministers and together they have been involved in church leadership for many years. Mac is honoured to lead this Eldership team and truly appreciates, and values, the amazing gifts and callings of these leaders that work together to bring spiritual oversight to CityGate Church. Mac also oversees the worship department and has a heart to see an increase of God’s presence as believers, in unity, worship the King of kings with undivided devotion. Both Mac and Judy’s desire for CityGate Church is to see all members find their “sweet spot” as they passionately pursue their destinies in God. They long to see Father’s Kingdom increase here on earth both at a local and global level as CityGate Church becomes an “Apostolic Hub” that impacts this generation, regardless of age.